March 3, 2015, Kansas City, MO: In the fall of 2014 local design professional Teko Bernard realized a way to promote the mission and goal of his Hoop Kid multimedia venture, would be to reach out to the Boys & Girls Clubs of Greater Kansas City (BGCGKC) about helping with their basketball leagues. The objective of Hoop Kid, founded in 2008, is to promote the importance and combined educational, health and social benefits of playing basketball and reading. 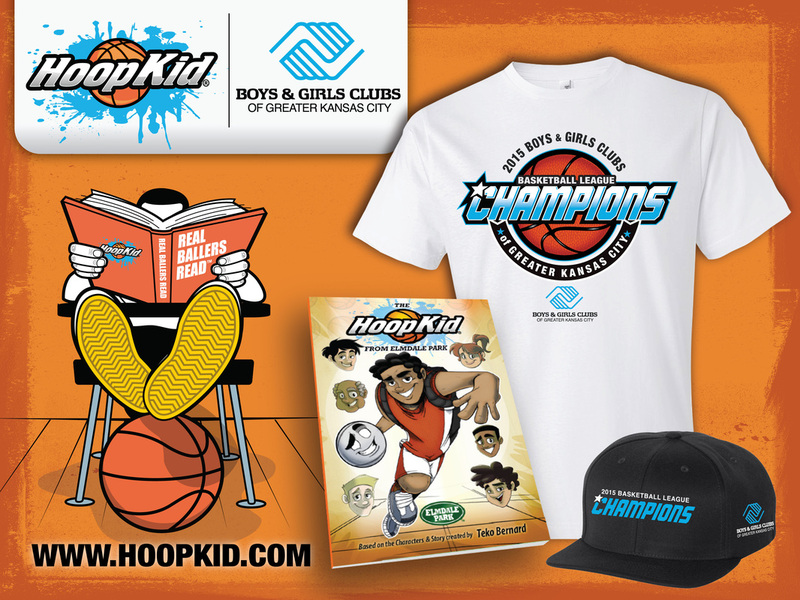 When BGCGKC announced its JAM!BOREE 2015 HOOPS TOURNAMENT, Hoop Kid committed another 100 copies of the paperback book, 1,000 free ebook downloads as well as championship shirts and hats for divisional winners of the March 7 event being held at the College Basketball Experience at 1401 Grand Blvd. in Kansas City. For Bernard this is really just the beginning of what he hopes is a long relationship with BGCGKC that will expand to other sports besides basketball. Bernard also sees the potential of partnering with other local Kansas City organizations that serve youth and are interested in promoting the importance of combining reading and sports. About Hoop Kid and Bernard Design Group: Teko Bernard of Bernard Design, LLC is creator and founder of Hoop Kid, a multimedia brand including a book series, apparel line, and online entertainment.